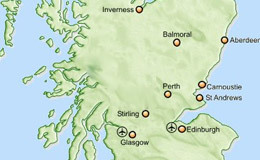 Book your taxi from Edinburgh to other cities in Scotland and England at affordable rates. City to City Transfers are our answer to a very popular demand for long-distance journeys, tailored to the client’s needs. If you don’t want to be tied down to train, bus or airport schedules that complicate your journey, or if you’d rather have a more comfortable experience when going from one city to another, this is the perfect option for you. At just £2 per mile, Capital Cars offers journeys from Edinburgh to Glasgow, Dunfermline, Kirkcaldy, Aberdeen and Newcastle among the most popular destinations with a fleet of versatile cars in all sizes for individuals or large groups. Whether you are travelling for a business meeting or organising a hen party or a stag do, our selection of saloon cars, people carriers and minibuses will carry you and your luggage there quickly and safely. Try booking with us today and start loving travelling. City transfers have never been so comfortable.